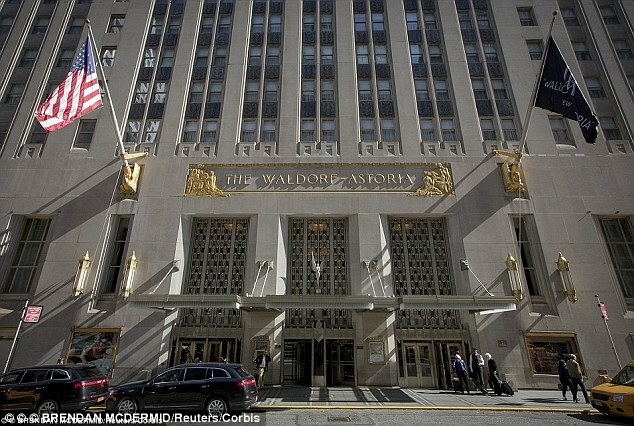 President Obama will not stay at the Waldorf Astoria tonight amid fears the place could be bugged after it was sold to a Chinese company. The Department of State had traditionally housed US officials at the prestigious hotel ever since Herbert Hoover first stayed there. But it has changed its policy since Hilton Worldwide announced it was selling the hotel to Anbang Insurance Group for $1.95 billion last year. Reports say there are fears the Chinese might set up a bugging system, Page Six reports. Famous celebrities who have made the hotel their home have included Frank Sinatra who kept a personal suite at the hotel between 1979 and 1988 for when he was out of Los Angeles, for nearly $1 million a year. President Herbert Hoover resided at The Waldorf for more than three decades, and President Dwight Eisenhower stayed from 1967–1969. President Eisenhower’s is reported to have been terrified of heights, and to accommodate them, a lift was specially designed to open on the 7th floor. The hotel apparently had an underground railroad which leads from the fourth floor of the basement to Grand Central Terminal, which was used as an entrance for President Franklin Delano Roosevelt. Obama, who is attending a fund-raiser and a Broadway show during his brief visit, will instead stay at Millennium’s ONE UN New York, sources said.